For 25 years the history of the region has been painted on almost every blank wall the town on Sheffield. Basket of fresh produce from the Kentish Council region. Sheffield is a small dairy farming town 23 kilometres south of Devonport. 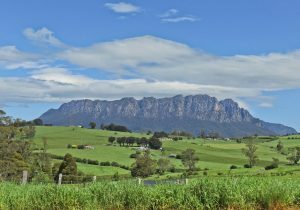 This inland area on Tasmania's northwest coast is world-renowned for high-quality butterfat products. The land is also amazingly sustainable for lamb and beef production. 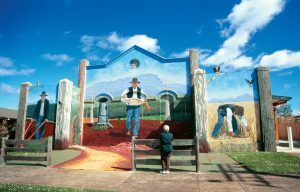 But this small rural town now draws tourists by the thousands for its colourful murals. While Sheffield is 23 kilometres from Devonport as the crow flies, you'll have to drive 30 kilometres by road. 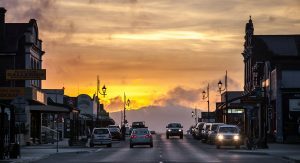 It's only a 30-minute drive from the northwest coast's largest city. Launceston is a little over an hour away sitting nearly 90 kilometres east of town. Hobart is 266 kilometres and a 3-hour drive to the south. Mount Roland towers off in the distance of this friendly rural town. Once an industrial hub for the northwest of Tasmania, Sheffield has reemerged as an arts community. Now it is a town covered in beautiful murals. In the centre of Sheffield, you'll find Mural Park. The park hosts an annual Mural Fest Painting Competition. Nine artists compete for over 6 days to be crowned with the prize of the town's best mural. Now with over 140 murals, this rural town is its own outdoor gallery worth an afternoon walk. Sheffield's Mural House is full of indoor murals inspired by Aboriginal art. And the murals are not just relegated to walls. Every building front is covered in colorful paintings, and you'll discover unusual letterboxes on a walk through town. Sheffield became the Town of Murals due to the pioneering work of the Kentish Association for Tourism and a local named Brian Inder. 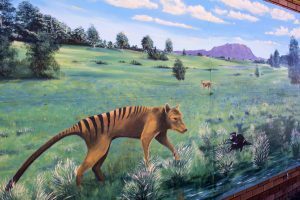 The first murals went up in the mid-80's and depicted the towns history as well as its thundering natural surrounds. More murals are added every year and Sheffield now attracts over 200,000 tourists annually. The murals don't only attract tourists. Artists flock to Sheffield to work in studios that are open to the public. There are a number of places in town where you can watch artists ply their crafts, and it's not just for murals. You can watch photographers, fine art painters, glass workers, wood crafters, pottery makers and craftsmen create unusual and unique pieces of art. The International Mural Fest started in 2003 and it takes place every April. Mural artists descend on Sheffield to create works inspired by a single poem for the competition. The nine best murals, including the winning mural, are left on display throughout the year until the next festival. Hundreds of thousands of people come through Sheffield every year, but accommodation is scarce. You'll find a bed-and-breakfast, Motor Inn and a retreat in the middle of town. It's best to make reservations far ahead of time. Mount Roland towers over the town of Sheffield at 1,234 metres above sea level. The mountain not only gives Sheffield a beautiful view, it challenges hikers from around the world. All around the mountain is the Mount Roland Conservation Area and Regional Reserve. The 7,600-hectare of range are full of well-marked bush walks. You can also challenge yourself to the towering summit of the mountain. From the mountaintop, you'll be able to see the Bass Street, Cradle Mountain and Barn Bluff. 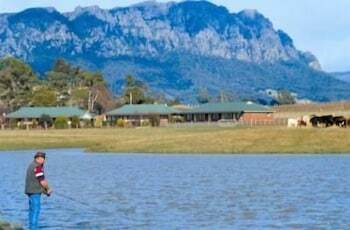 Rowing, waterskiing, canoeing and fishing await at Lake Barrington. The site of the 1990 World Rowing Championships, Lake Barrington was flooded in 1969 by the Devils Gate Dam on the Forth River. There are two waterskiing clubs on the lake as well as a visitors facility, picnic sites, boat ramps and public toilets. Built into a narrow gorge, the Devils Gate Dam that created Lake Barrington is one of the thinnest concrete arch dams on earth. Its overhanging crest allows flooding to waterfall into the riverbed below. More than 2,000 tons of water can fall per second during tumultuous floods. The dam was commissioned in 1969 and stands at over 84 metres tall. Lake Cethana is a lovely day walk from town. The trailhead can be found near Lemonthyme Wilderness Retreat. The challenging two-hour walk takes you across a fern gully through forests and to the backwaters of the lake. Sheffield features a couple of casual local restaurants as well as a burger joint and a Chinese food restaurant in the heart of town. Sheffield has a lovely warm and temperate climate. The temperature never climbs too high in the summer and it rarely gets to freezing in winter. But it is rainy throughout the year. It rains much more in winter than in summer. Head over to the Kentish Museum which shows you the complete Mersey-Forth hydroelectric scheme. It also gives you information about the world's first self-serve petrol pump. After marvelling at the murals, head out on a nature walk at Badger Range or O'Neill's Creek. Get lost over in Tasmazia. This massive maze complex features eight different mazes, a gift shop, pancake parlour and model village. You can find it in the nearby hamlet of Promised Land. Kimberley Warm Springs is a nearby geothermal phenomenon with a visitor center. 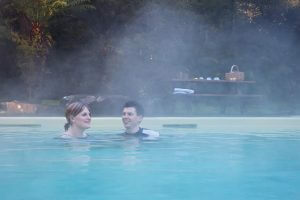 Located in the town of Kimberley, the Warm Springs create an eerie and beautiful natural habitat.